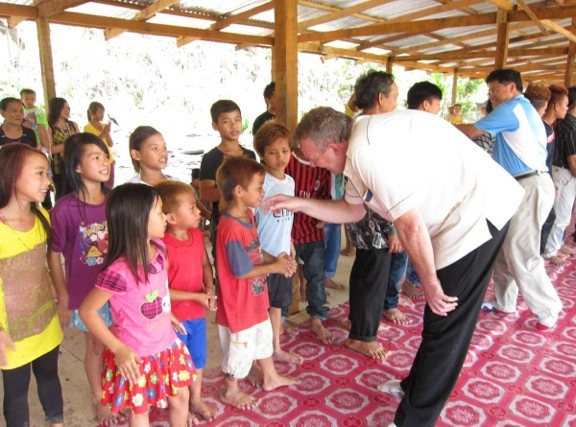 Millionaire Tostein Sjotveit poses with the kids he plans to wash out of their homes. The Chief Executive of Taib’s closely controlled Sarawak Energy Board, the Norwegian Torstein Dale Sjotveit, has been working hard to merit his extraordinary four million dollar a year salary. His principle job is to push through SCORE, which is the Chief Minister’s monstrous plan to build up to 50 dams in the state. It is also to make sure that all the plum Sarawak Energy contracts go to Taib’s own family in the process. Nevertheless Sjotveit has been working hard to build respectability for the project internationally. He has taken to touring native communities (who have not been properly canvassed or informed or compensated in any dam project in Sarawak so far) and attempting not always successfully to pose with the people. 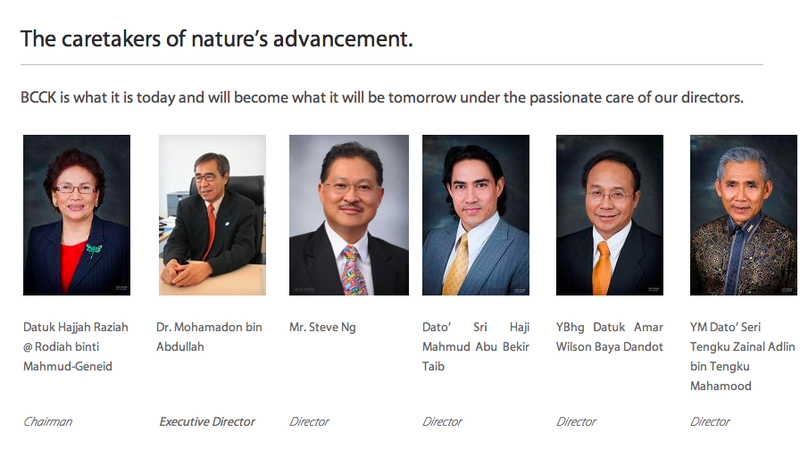 Having got Sarawak membership of the International Hydropower Association (IHA) back in 2010 (merely a matter of paying a membership fee) Torstein then managed to force himself onto the actual board of this supposedly eco-conscious body in just a matter of months. Now the Association is holding its Annual Conference in Kuching, the capital of one of its newest members, next week. The lure of course is the promise of the enormous contracts that will be available to these fellow industry players from further destroying Sarawak with currently the world’s largest and most unnecessary dam-building exercise. After all, the existing Bakun Dam has yet to define a reason for its existence and has left Sarawak over-provided with electricity for a population where many still have no access to the grid. Neither have the correct criteria been followed in terms of environmental and human rights assessments for the Murum Dam that is currently being constructed, which leaves the ‘sustainability’ credentials so heavily promoted by the supposedly responsible and eco-conscious IHA open to considerable question. Nevertheless, the culmination of all Mr Sjotveit’s manoeuvrings is to go ahead with the opening of the International Hydropower Association’s Conference at the Taib family run Borneo Convention Centre (BCCK) on May 20th. This event may turn out to be highly counter-productive, however. Since it has focused a growing number of the world’s environment organisations on the disgraceful corruption and abuse of human and native rights in Sarawak. 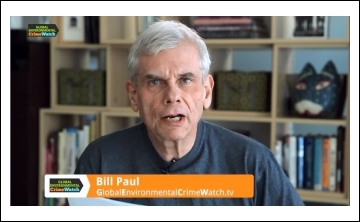 The article below from the respected NGO International Rivers sums up the growing global disapproval over any organisation that does business with Taib Mahmud’s despotic regime. 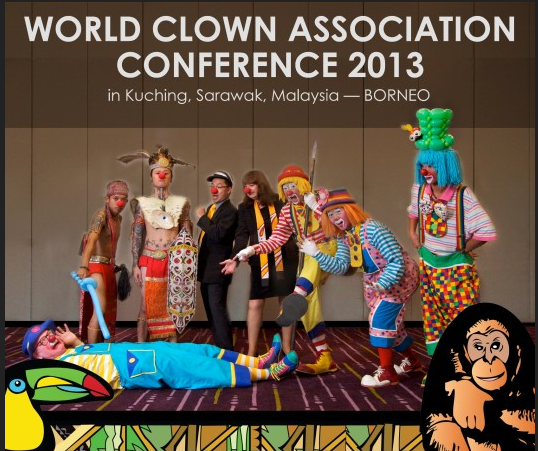 The last international group to hold its conference at the Borneo Convention Centre was the World Clown Association in February. Hydropower Association delegates may be starting at last to wonder if they are about to make clowns of themselves also, by getting involved in such a blatant and disgraceful monument to corruption as Taib’s SCORE project? The NGO International Rivers have released this assessment of Taib’s SCORE project on the eve of the International Hydropower Association Conference in Kuching. The Malaysian state of Sarawak is the new star of the global hydropower industry. Located on the island of Borneo in Southeast Asia, Sarawak is largely unknown around the world. Five years ago, Sarawak’s ruler Mr. Abdul Taib Mahmud announced that he will “transform Sarawak into a developed state” by building 12 large dams in the state’s remote, tropical forests. He argues that the dams will produce an abundance of cheap electricity, which will attract heavy industry and create jobs. Reuters has called Taib’s scheme “staggeringly ambitious,” especially since the dams will produce 450% more electricity than Sarawak currently needs. Mr. Taib’s scheme has caught the attention of the world’s leading hydropower companies. Next week, on May 20-25, Sarawak will host the industry’s world congress, which is organized every few years by the International Hydropower Association (IHA). The IHA’s mission is to demonstrate that large dams—which are often a source of controversy—can be built in an environmentally and socially responsible way. The IHA is now promoting Sarawak as an example of responsible dam-building that brings profit as well as local development. Sarawak has a dark history of dam building, having completed the disastrous Bakun Dam in 2011 after five decades of delays. 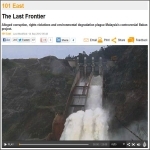 The project is widely criticized for displacing 10,000 indigenous people and leaving them in impoverished conditions, while much of its electricity remains unused. However, Mr. Taib says his government has learned lessons from the Bakun Dam and is committed to do a better job on the next 12 dams. IHA is advising the Sarawak government and will showcase its efforts at next week’s congress. The Sarawak government will also use the opportunity to reach out to potential investors. Doing business in Sarawak requires buying the favor of Mr. Taib, who has ruled Sarawak since 1981. Corruption is well documented. The government carefully controls the information that reaches the public, and journalists are forbidden from scrutinizing Mr. Taib. This creates serious risks for investors who want to steer clear of corruption and human rights abuses. The IHA has helped the Sarawak government to make modest improvements in its dams. Yet this has not been enough. To date, IHA’s efforts have been largely cosmetic and do not address the real challenges of investing in Mr. Taib’s dams. The developer and public face of the Sarawak dams, Sarawak Energy, is trying desperately to portray itself as an independent company that operates according to international standards. In fact, the company is 100% owned by the government and is directly accountable to Mr. Taib. Mr. Taib was actively involved in selecting the company’s current CEO, and a majority of the board members previously served as Mr. Taib’s political appointees. The chairman of the board is Mr. Taib’s cousin and one of his closest business partners. Sarawak Energy is the main implementer of Mr. Taib’s rapid development scheme, which he calls the Sarawak Corridor of Renewable Energy (SCORE). Because of these close connections, it should come as no surprise that Sarawak Energy has started providing key SCORE contracts to companies owned by Mr. Taib’s family. This also means that the Sarawak dams are not constrained by the law. The IHA’s first project in Sarawak, the Murum Dam, is a prime example. Affected communities did not even learn about the Murum Dam until after construction started. Construction began before an environmental and social impact assessment was conducted. The impact assessment still has not been made available to the public or affected communities, although the project is nearly operational. Despite these violations of Sarawak law, the government has made no efforts to bring the project back into compliance. The IHA continues to uphold the project as a model for the industry to follow. During his 30 years in power, Mr. Taib has used his position to become one of Southeast Asia’s wealthiest men. His family now controls most of the Sarawak economy and has a controlling ownership stake in many of the local companies involved in the dams and SCORE initiative, including Sarawak’s largest construction company and cement monopoly Cahya Mata Sarawak. Mr. Taib has also used his power to distribute Sarawak lands and forests to his family members and friends, often to be exploited for timber and palm oil. 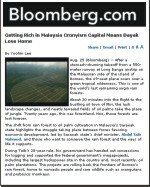 In 2012, the Malaysia Anti-Corruption Commission began investigating Mr. Taib and Sarawak Energy’s CEO.Swiss lawmakers have taken steps to freeze Mr. Taib’s assets, and the U.S. government has noted that Mr. Taib is “highly corrupt.” In March 2013, Global Witness released a video of an undercover investigation that recorded members of Taib’s family admitting to various corrupt practices. During the recent Malaysian national elections, investigative journalists at theSarawak Report documented hundreds of cases of bribery inside Sarawak by Mr. Taib’s colleagues. However, Mr. Taib is largely untouchable due to his strong political ties to Malaysia’s ruling party, which itself has been in power for 56 years. The IHA has not found a way to address these corruption issues. In 2012, Australian company HydroTasmania—one of the most active IHA members and the main author of the IHA’s flagship “Hydropower Sustainability Assessment Protocol”—came under scrutiny for its role in the Sarawak dams. In an interview on ABC Radio Australia, HydroTasmania’s CEO Roy Adair admitted that the company did not conduct any anti-corruption auditing before agreeing to work with the Sarawak government, nor did it conduct any human rights due diligence. Rather, Mr. Adair assumed there was no corruption because Sarawak Energy was a member of the IHA. Eventually, HydroTasmania was forced to announce that it would withdraw from the Sarawak dams by the end of 2013. Over 40 indigenous groups, comprising tens of thousands of people, have lived in Sarawak’s forests for generations. Since Mr. Taib came to power, these communities have found their traditional lands taken and sold, often without their knowledge. Only 5 percent of Sarawak’s primary forests remain, much of the rest having been logged and converted to palm oil plantations. This rapid deforestation has already placed great stress on indigenous communities, who have been displaced and have lost access to many of the natural resources that they depend on. Discrimination against indigenous peoples is pervasive. Mr. Taib’s government does not fully recognize indigenous people’s claims to their traditional lands. 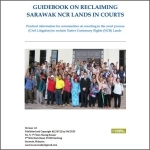 Many Malaysian court rulings in favor of indigenous rights are not upheld in Sarawak. Thousands of indigenous people are unable to obtain the state identity cards that allow them to gain employment and access public services. Local activists report that the government has threatened to withhold welfare services from indigenous communities if they do not support government initiatives, including the dams. In many communities, Mr. Taib has gone as far as appointing village headmen, undermining traditional structures and leaving many communities without leaders to represent their interests at the state level. With such deeply embedded problems, companies that invest in the Sarawak dams face a huge risk of becoming involved in human rights violations against Sarawak’s indigenous peoples. The Sarawak government has made no efforts to strengthen indigenous communities’ rights to land before seizing it for the dams. The next dam scheduled to begin construction, the Baram Dam, will displace up to 20,000 indigenous people and flood an area of 388 square kilometers. Unless reforms are made, the risk of conflict remains high. By gaining the IHA’s support, Mr. Taib has succeeded in giving many investors the impression that the Sarawak dams are being developed in a responsible way. In reality, enormous challenges exist that the IHA has proved unable to manage. Companies that invest in the Sarawak dams are still exposed to the risk of becoming embroiled in corruption scandals, human rights violations, and conflict. Unfortunately, for some investors, this is not a deterrent. SIB and all Churches should bring greater political awareness and spiritual valueto the rural and remote parts of Sarawak. 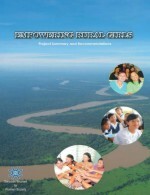 Rural Sarawak are in dire need of development, better health care and education facilities. The Agriculture Ministry and Agriculture Department had been a total let down for many decades. Rural folk continue to depend on subsistence crops and remain poor and neglected. Churches are not allow to involve in politics. Its not that the rural people aware of the situation of the country; its just their mind set…. so their living quality is their choice. Will God punish the churches and priests or pastors for preaching political awareness and the rejection of corrupted politicians? The Churches have been solely responsible for bringing education to the most remote parts of the country since 100 years ago and preaching political awareness is just another form of education unless our country has a law which outlaw Churches from educating the uneducated rural people about politic. GOOD LUCK,YOU ARE ON YOUR OWN. The orang Ulu affected by the dams should come out in full support of Taib Mahmud and hail him as God sent to the community. They should also hold daily prayer to keep Taib healthy and alive for many more years to come. They had voted for BN and had taken BN’s dirty money so they derserved to be robbed and displaced by Taib Mahmud. Murum is not in Baram lah! Anyway,i failed my local geography test as well and i was sober! What is important is that we continue to make more people aware of taibs sinister agenda towards all of the dayaks tribes. 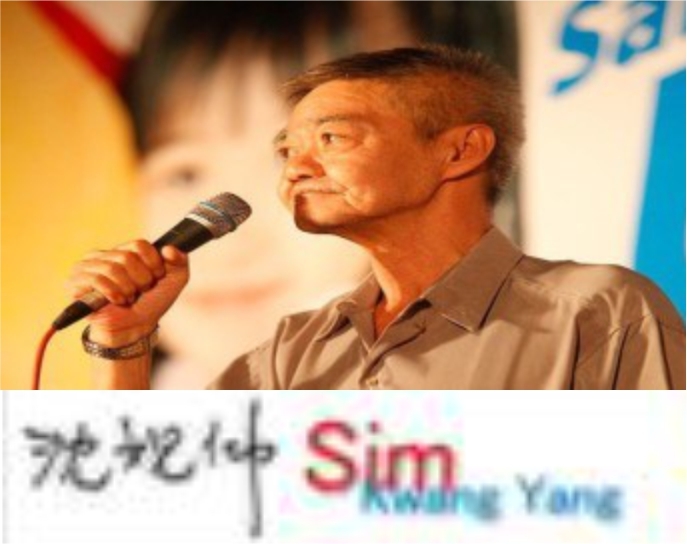 He failed to uplift the livihood of the people affected and displaced by the Batang Ai and Bakun damned dams and he still dare lie to the members of IHA conference in Kuching that his proposed Damned dams are to be build for the benefit of the people. Let be honest,the resettlement of natives displaced by both Batang Ai and Bakun failed to improve their lives. Infact it made it more difficult for them to function as they wish like when they still had their lands and farms. The same fate is awaiting those Penans being displaced by the MURUM damned dams and the rest of the natives who are facing displacement and forced resettlements! The only people who will gain and prosper from the building of his damned dams are those members of IHA, the Banks and of course taib and his chinese cronies! There nothing that would make these people happy other then making the natives poor and suffer in abject poverty! Those IHA members attending the conference do not have any shame at all, attending a conference in support of a corrupt gov’t, turning a blind eye to the sufferings of the natives. We natives are struggling to cope with our lives, trying to makes sense out of all these insane destructions, displacement, forced resettlements, loosing our lands to greedy plantations owners etc etc and here they are from far and near in a conference to discuss and agree to do more destructions? Will see where they will move…… we will not let this people be re-settle in our land i.e. the Kenyah/Kayan/Penan. You are welcome up river. They can happily choose to resettle on floating houses in the dam itself with RM10,000 to RM20,000 given by Taib Mahmud. Or ask taib to built them houses that can hover in the sky above his palace across river? Let us gather in big numbers outside BCCK, SESCO HQ and Taib Mahmud’s house with a strong conviction to oppose the construction of more dams and the IHA conference. We must stand firm and stop further plundering and destruction to our environment and infringement on human rights of our natives. Why gather? Its the Sarawak…especially the Dayak choice. Rod, not everybody voted for BN like you! DIRTY GOVERNMENT = ONE PUBLIC SERVANT GIVING CONTRACTS TO ANOTHER PUBLIC SERVANT! This is corruption of the highest order by Taib and Sjotveit and deserves the most severe penalties! 4. Query corruption – Payments of commission/kickbacks to Taib or Sjotveit in relation to the contracts? 5. Failure to carry out professional duties by CEO of Sarawak Energy. Mr. Sjotveit is employed to work as CEO of Sarawak Energy, a state-owned power supplier. He is entrusted to look after the interests of the public not the private interests of the Taib Mahmud families and cronies. He has betrayed this trust and is in serious breach of his employment terms and conditions (Sarawak Report need to dig into this) to avoid conflict of interests. He has also abused his position and powers and failed to explain to the public what he has done. 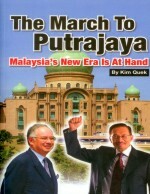 BMF should also submit report to the MACC and the Police so they can be held to account for not prosecuting the 2 crooks.